I previously shared our food journey with you and talked about how I transitioned from feeding Chester some junk dog food to feeding both dogs raw. If you missed the series, you can catch my last post about deciding to feed raw here. I rotate their diet between a few different prepared, frozen raw foods but I prefer to feed Chester and Gretel food that is just organs, meat, blood, and bones with maybe some omega oils an vitamins mixed in (no veggies – dogs can get all of their nutrients from raw food without them). Feeding raw food at home is easy but taking it with us on hikes is not practical. Besides the fact that raw meat can’t be refrigerated, it could leak meat juice in a backpack making a mess and attracting wild animals. If we are out for the day and plan to be home around dinner time, I just wait until we get home to feed Chester and Gretel. If we plan to get home late in the evening, or plan to camp overnight, I bring freeze-dried raw dog food with us. As with their frozen raw, I like to switch up foods now and then. 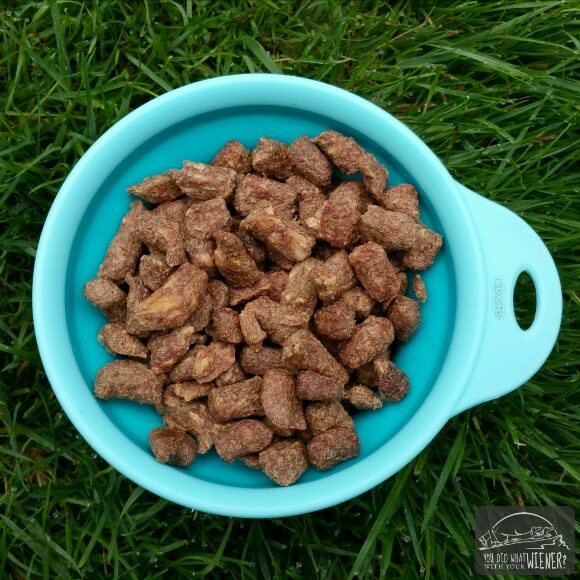 I use one go-go food most of the time though – TruDog FEED ME Raw Super Food. I prefer to feed Chester and Gretel the beef recipe (Beef Delight) but it also comes in Turkey (Gourmet Gobbler). Disclosure: I love the TruDog Feed Me food. I have purchased it myself but they also sent me a few extra bags to use for a review. I’m sharing this food with you because I truly think it’s great and TruDog is not responsible for anything I say. Why is TruDog FEED ME it so Great? TruDog® is a small family owned brand. The FEED ME Real Meat Super Food is 99% vital organs, muscle meat, blood, and bones. There are absolutely no fillers, veggies, or artificial preservatives. The meat used is 100% farm raised and grass-fed in Wisconsin. It’s flash frozen for guaranteed freshness and then freeze-dried in a vacuum chamber. The food is super fresh because it goes from farm to table, or dog food bag, in less than 72 hours. TruDog Food receives a 5 star rating, and is “enthusiastically recommended” by Dog Food Advisor. It’s approximately 41% protein, and 28% fat with zero carbs. Since the food contains a high percentage of fat, and dogs get most of their energy from fat, it’s an especially great food for us to take hiking when Chester and Gretel are expending more energy. The food is formed into little nuggets. That means that it’s just as easy to fee as kibble – just scoop and dump our pour from the bag. The great thing about the little nuggets is that they double as treats so I don’t have to carry several bags of stuff. Because it’s freeze-dried, it doesn’t contain any moisture like kibble or frozen raw food. That means it requires to refrigeration. It also means its super light to pack (this is the food I recommend to bring hiking and backpacking even if your dog normally eats kibble because it’s so much lighter). Don’t worry, the nuggets are pretty “sturdy” too so they don’t crumble when crammed tight into a backpack (like some other freeze-dried foods). I’m lucky that Chester and Gretel have iron guts. I can switch their foods willy-nilly without upsetting their tummies. You may want to slowly transition your dog though, especially if they are eating kibble or a partial raw diet. The first step is to determine how much food you need to feet your dog a day. Because it’s freeze-dried, you will likely be feeding your dog less than you think you should. I forget where I read it but I think that 1 – 10 oz bag of TruDog FEED ME equals 2.5 lbs of food when reconstituted. You can check out the back of the package for general guidelines or use their online calculator to get more specific. The calculator is great because you can enter the exact weight of your dog and your goals for them – like losing weight, maintaining, or gaining weight – to get a custom recommendation. As an example, Gretel is 11 lbs and needs 0.66 of a cup a day to maintain her weight under normal circumstances. Because she expends a lot of energy hiking, I selected the “slight weight gain” category in the online calculator so I would know how much more to feed her when we are out adventuring. That calculation brought it up to 0.83 cups a day. The calculator is also cool because it tells you how long a bag of food will last at the recommended feeding rate for your dog. Under normal feeding conditions, Gretel would go through about 3/4 of a 10 oz bag a week. 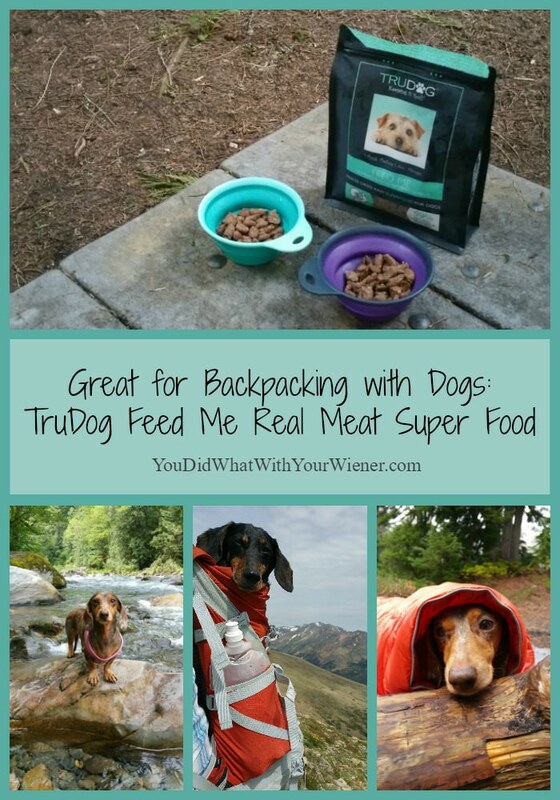 Once you know how much of the food to give your dog, you can transition your dog to the food starting about a week before your backpacking trip. It’s a good idea to add water to the bowl with the food for extra hydration. It’s not absolutely necessary as long as your dog has access to plenty of fresh water after eating it but it does help release essential nutrients. Just be aware that even with warm water, and after sitting for 10 minutes, it won’t look like “raw meat”. Dogs often like the crunchy goodness though. Check out TruDog Feed Me for yourself. TruDog also makes treats, supplements, and the Orapup brush I like to use for Chester and Gretel’s breath. Awesome! I have two dachshunds too!! always looking for best info! Have you read “Lily and the Octopus” yet? I just received it as a birthday gift. I haven’t read it. I honestly don’t have much time to read books for fun (usually just learning and research). Hope you like it though.